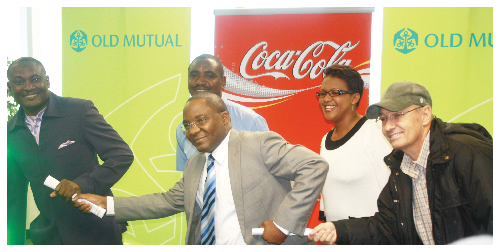 The annual Old Mutual Victory Race will this year kick off in Keetmanshoop on 16 June followed by Swakopmund on 30 June while the Northern leg will take place in Oshakati on 21 July, finally ending on 4 August in Windhoek. For the first time in the history of the race, organisers have secured the services of an official route measurer. Speaking at the launch, the CEO: Operations at Old Mutual, Sakaria Nghikembua said that the official route measuring of both the Windhoek and Swakopmund routes means that they are now officially recognised as qualifying heats for regional and other events. He said that this will save athletes the expense of having to travel outside the country in order to compete on officially measured routes. Old Mutual once again donated N$510,000 at the launch of the 12th Annual Victory Race that was held in Windhoek this week. Of this money, N$12 000 will go towards bursaries for two learners that will be awarded at the end of the race series. Nghikembua said that this year’s victory race will once again accord athletes from all over the country the opportunity to show-off their running abilities as races will take place in the four major centres of the country.